Welcome to the home of First Light Mountain Guides. We are Dougal Tavener and Danny Uhlmann, an IFMGA/UIAGM/IVBV mountain guides based in Chamonix, France. We offer unique climbing and skiing trips in the Alps and abroad. Each trip is organized and guided by ourselves and is designed specifically around your desires, abilities, and the conditions at hand. We look forward to hearing from you. I offer trips for private groups of skiers and climbers, as well as public programs focused on education for the high mountain environment. For ski and snowboard mountaineering, off-piste, and alpine climbing, the Alps are the center of the known universe. This is where the cutting edge is established and where it is exceeded. Not everything is extreme here though. There are limitless options for riders and climbers of all levels. The touring in the Alps is unparalleled. With a little bit of up, we gain access to huge and exciting runs on glaciers, couloirs, faces, and forests. 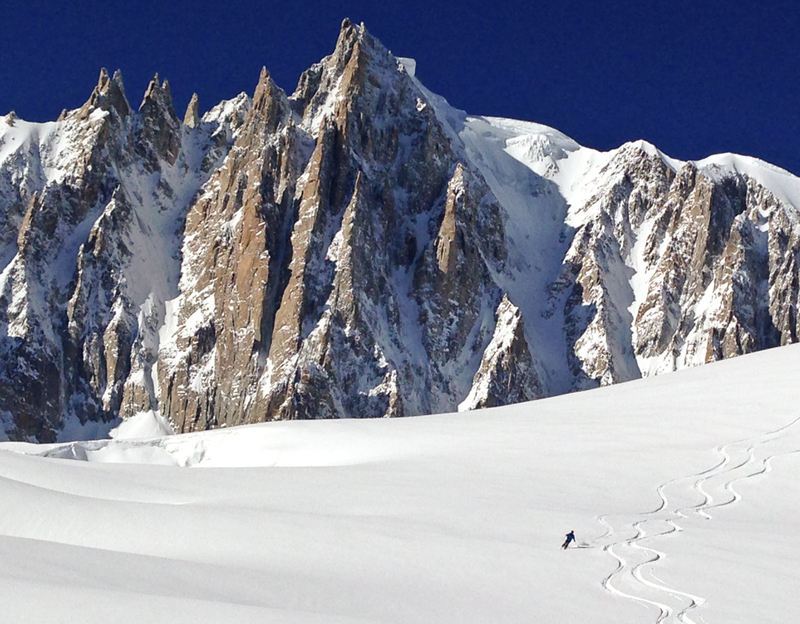 The Mont-Blanc Massif has options of all levels for winter alpine mixed climbing. The name of the game here is POWder. Using fat skis or snowboards on the incredible lift systems, and specialized local knowledge, we get to the goods. Cogne, Kanderstag, Chamonix...the list goes on for waterfall mixed and ice climbing. This is what Chamonix, and the Alps, are known for. Some of the most famous steep lines in the world are accessible right here for skiers or riders of advanced ability level. This 6-day intensive course will jumpstart your big mountain riding career. My 2018 summer is completely booked. Please contact me now about summer 2019 trips. Arete du Cosmiques, Mont Blanc in the background. Moderate ridge climbs, 4,000 meter peaks, steep rock climbs, alpine ice, mixed, glaciers...its all right here. The word for the Alps is "stacked." No where else in the world are there so many options with so much diversity. If your goal is to do as much Alpine climbing as possible with your time, this is the place to come. All trips are private and are organized on an individual basis. Mont-Blanc, Aiguille Verte, Les Aiguilles des Chamonix, Deant du Geant...the list is long and the climbing varied here. Everything from steep granite crack climbing to alpine ice and moderate glacier climbs. The well known Eiger and Matterhorn often draw people to the Swiss Alps but there is much more to climb as well. Long alpine ridge climbs at altitude, sleeping in huts, and eating rosti. Dolomites offer high-quality and classy adventure on rock and alpine climbs. That combined with the perfect nature of being in Italy makes for a well-rounded climbing experience. Yosemite is, without question, the most spectacular roadside traditional climbing there is. There is something for everyone here. From splitter granite cracks to multi-day bigwall climbs, to speedclimbing and bouldering.